The strength of George Osborne, we are told, lies in his political skills. Tactically one can only approve of the way he has promptly seized on news of Darling's triumph over Brown in the matter of being honest on the need for budget cuts, to ratchet up his own rhetoric behind this convenient cover. Clegg having already spoken of the need for swingeing cuts, the Tories can thus portray themselves as being no more than part of the establishment consensus, with the prospect of defusing an otherwise uncomfortable election issue. 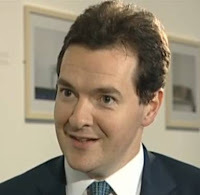 Unfortunately ... while Gordon Brown’s inappropriate smiling is legendary, the Boy Osborne is, if possible, even worse. Here he is on Thursday’s Newsnight (starts around 4:20 - screen-grab below), as part of his canny post-Darling plan. He is telling us that the awful lesson of the Swedish banking crisis is, we must cut early and cut deep. OK, we all know it is true, but we don’t want to hear it from someone giving the impression he’s really pleased to break this piece of news, and generally enjoying every minute. These things matter. It may of course be the case that he was born with this infuriating grin, but we don’t need it playing on his chops as he jauntily announces gloom and doom: the effect is shocking. By all means deploy Osborne for his student-union low political cunning: but for pity’s sake bring on Phil Hammond if there are interviews like this to be conducted in future. Wasn't it Brown who was appointed Chancellor on the basis of his poltical skills rather than his grasp of either economics or finance? Just don't kick him in the balls, his voice is too high already. More seriously, he needs a voice coach, he sounds far too shrill. I'm the kind of guy who enjoys to seek hot things. Currently I'm manufacturing my private photovoltaic panels. I am managing it all by myself without the assistance of my staff. I am utilizing the internet as the only path to acheive that. I came across a very amazing website which explains how to make pv panels and so on. The website explains all the steps involved in solar panel construction. I am not really sure about how accurate the info given there is. If some experts over here who had xp with these works can have a see and give your feedback in the page it would be great and I'd extremely treasure it, cause I truly lav solar panel construction. alleged political skills - great qualification for a chancellor. He's a lightweight with no track record and I can't see him being strong enough. These are gameplayers of the worst kind. When they should be grasping the bull by the horns and addressing the democratic deficit and getting us the hell out of the EU, they decide to employ an advertising agency to make Cameron look better, to look more sincere. Cameron has split the conservative ranks and all attempts to pretend it hasn't happened are naive and will be reflected in May. I was at our conference and that message came through loud and clear. Osborne must be dumped henceforth from that portfolio. He has as much economic acumen as me but at least my forecasts are correct. If he's such a good politico, then he needs to be in a sort of Prescott roving commission role. On a personal level, I like little Georgie. He knows bugger all about tax and economics and so on (and I would never vote for him), but he has one talent worth nurturing, namely the uncanny ability to drive Gordon Brown into fits of apoplexy. I am sick of people with strong 'political skills' (whatever they are? ), I want people running this country who know and speak the TRUTH. YOU* CAN'T HANDlE THE TRUTH!